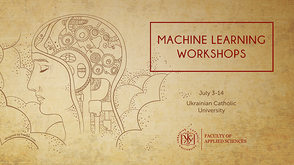 Machine Learning Summer Workshops are organized by Faculty of Applied Science at Ukrainian Catholic University. Workshops’ participants — young professionals, students, Ph.D. candidates — will study the methods of the machine learning in the problem domains of Computer Vision, Natural Language Processing, and Reinforcement Learning. The workshops are all problem-oriented, i. e. study process will be based on the real-world problems and their solutions via machine learning approach. The participants will gain solid theoretical knowledge as well as a lot of practical work. Please notice that participants’ knowledge and skills level should be intermediate or higher. The students have to be familiar with the basic machine learning methods. There are will be three totally independent workshops (two of them go simultaneously). You may apply for one or two workshops. The information about particular workshops can be found on separate web pages. Below there are the brief descriptions, lecturers, price and terms information. More information on the Computer Vision workshop web page. More information on the Natural Language Processing workshop web page. More information on the Reinforcement Learning workshop web page.